Pondering between the Purple and Helix mattress? Not sure which one will be better for you? Well, you’ve come to the right place! In our Helix vs Purple mattress comparison, we will be putting these brands side by side. Giving you the low down on what each of these beds under $1000 has to offer. Going through key performance and sleeping categories that are important for any mattress you are considering. Our Sleep Guide is giving you the ultimate easy to read guide to help you decide! This review will not only be using the facts to find objective comparisons but since we have been able to try both of these mattresses first hand, we can also lend our personal opinion as well. Both of these beds are unique, however, what makes them unique is quite different. Both happen to also come in right around the same price point and will appeal to several sleepers. The Helix mattress has also established itself over the last several years. Winning customers over with a customizable hybrid bed made just for them. 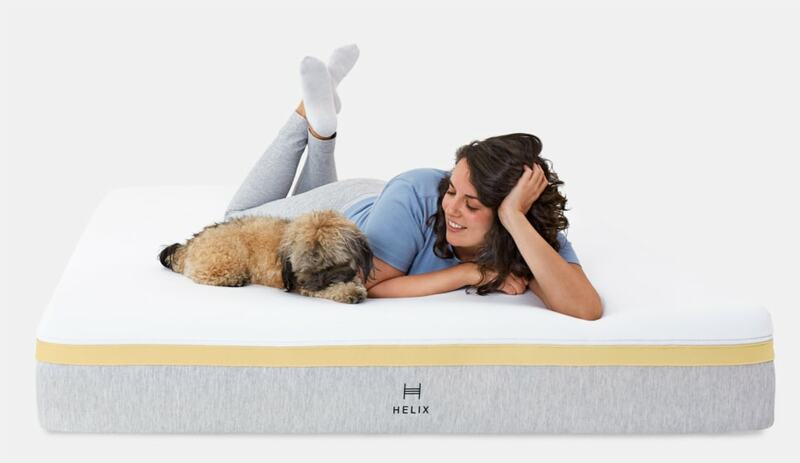 Summer of 2018 has brought some fabulous changes to the Helix brand and mattress. With updates to the materials and build that amplify all the benefits of this bed. The most amazing aspect of these upgrades is that it DIDN’T impact the price tag. Giving you better quality and durability and even more access to choosing the perfect mattress specifically for you at a great value. And given the competition, including Purple, a run for its money. See all the great updates Helix has to offer at HelixSleep.com. And make sure to check out our full review of the Helix Mattress. 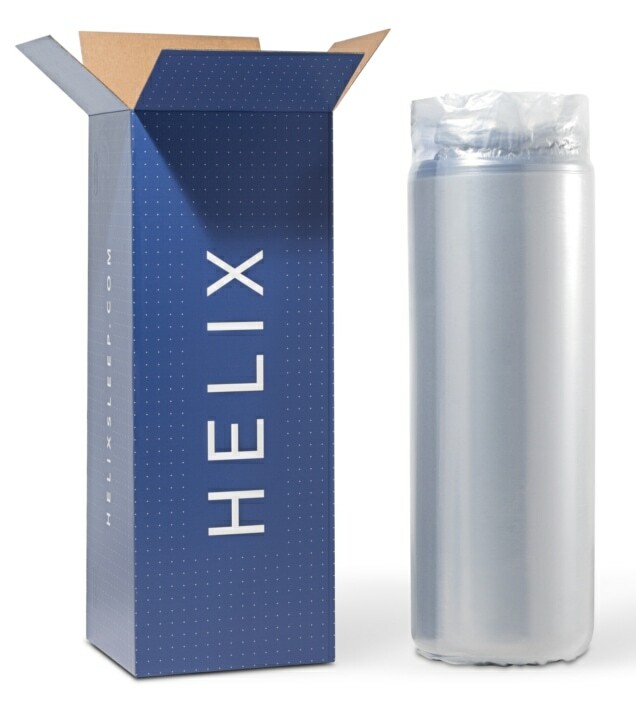 Helix Coupon: SAVE BIG On Your New Helix Hybrid HERE! 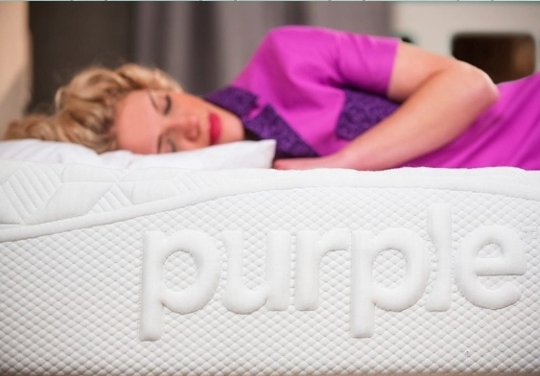 Purple has become very familiar and recognizable as an online mattress industry leader. Between their uniquely designed mattress and quirky advertising, they are quite memorable. The Purple mattress has one universal feel that should appeal to many sleepers. Using a grid patterned elastic polymer over several inches of foams gives this bed a one of a kind feel. It prides itself on offering a bed with an abundance of pressure relief that sleeps cooler too. But does the Purple delivery or is the “raw egg challenge” just a clever ploy? Looking to learn more and shop the Purple mattress? Just head over to Purple.com. Or jump over to our full Purple mattress review. The Helix and Purple mattresses both include shipping in their pricing. Giving no added charges to have your mattress conveniently delivered right to your door. After ordering the Helix it was delivered in about a week. While the Purple took a good three to four weeks before we received it. Depending on their status the Purple mattress may take several weeks to get, so you may need to be a bit more patient waiting for the arrival of your new bed. Once you receive your new mattress, whether it is a Helix or Purple, the rest of the process is quite similar. Getting your compressed mattress to your bedroom will be the hardest part of the process. We definitely recommend two people for this job. Though they are compact they are still very heavy and a little awkward to maneuver. Once you get the box, or bag, to your room all you need to do is remove the plastic-wrapped mattress. Position on your foundation or frame and carefully cut the plastic away. Initially, it will expand fairly quickly giving you an almost fully usable mattress within minutes. Though this part seems quick the foams of the mattress do take several hours, even several days, to fully firm up. So the mattress can be slept on in a few hours after unboxing but will more than likely alter firmness levels and comfort in the first few days. So just keep that in mind. Experience sleep customized to your preferences with Helix. Shop and learn more at HelixSleep.com. Or get your uniquely made Purple mattress at Purple.com! During the unboxing process, you will notice a few “new” mattress smells from both the Purple and Helix. However, the initial off gassing of the Helix mattress was fairly short and dissipated quickly. Leaving little to no scent behind after a few hours. The Purple, on the other hand, was quite strong initially as well as took several days to fully air out. Making it quite memorable in this category, for reasons less desirable. More than likely the lingering scent of the Purple is probably due to the polymer grid, and after about a week it will be quite a bit less noticeable. Either way, letting your new mattress fully air out for several hours before sleeping on it is a good rule of thumb. And if you are more sensitive to smells opening a window during the process or leaving the room is always a good idea. When it comes to comparing the comfort of these two mattresses there are a few places to objectively start. First is the firmness level. How firm or soft a mattress is can be a good indicator of how it will work for your size and shape as well as your dominant sleeping positions. As you can see from the 10 point scale below, a soft mattress tends to be more ideal for side sleepers. And firmer mattresses work great for stomach sleepers. Back sleepers and combination sleepers tend to do well with a more medium to medium firm level of firmness. And sometimes it just comes down to personal preference and whatever provides the best night sleep for you. The Purple is offered in one universal medium-firm feel. This feel will fall right around a 5.5 to 6 on the firmness scale, for most sleepers. Clearly, this mattress will feel a bit softer for larger framed sleepers and a bit firmer for smaller framed sleepers. The goal of offering one level of comfort is to make the process easier and taking out the guesswork. However, this does leave you will only one option that may or may not work out for you. This firmness level is usually the most well received by the majority, making it the most ideal for only offering one option. The Helix mattress is quite a bit different when it comes to options. This bed is offered in 9 varying levels of comfort. Literally covering every spectrum of the comfort scale. 6 mattresses that offer a range from soft to firm as well as more or less support depending on your size. They also offer 3 specialty mattresses. One focusing on an ideal feel and support for the big and tall crowd. And two that offer dual comfort for partners with different sleeping styles and postitions. Giving you an abundance of choices for finding your perfect comfort level. Not only does Helix offer a multitude of options, but they also make it easy for you to choose from. By letting you pick the mattress that best suits your needs for yourself or helping you out with a quick questionnaire. Below is a brief description of each of these 9 choices. Featuring two soft to medium soft options; Helix Sunset & Helix Moonlight. Two medium feeling options; the Helix Midnight & Helix Dusk. As well as two firmer options; the Helix Twilight & Helix Dawn. And the three specialty mattresses including the large and tall mattress; the Helix Nightfall . As well as two dual-sided options; the Helix Dual Balanced & Helix Dual Extra. 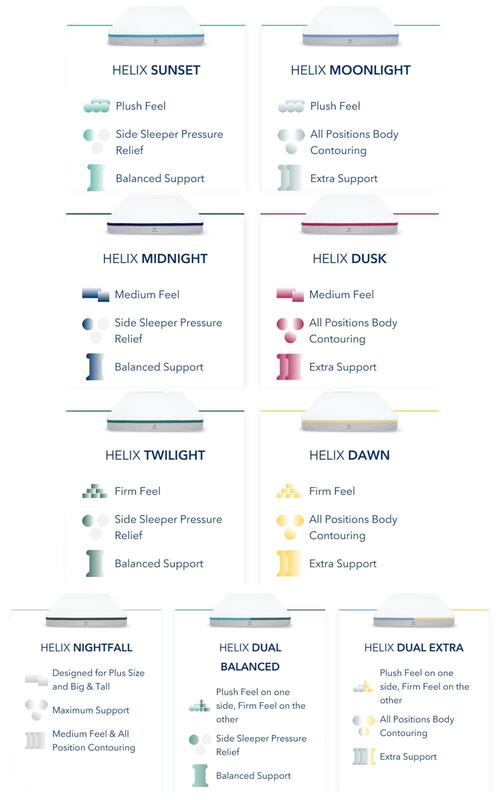 Learn more about the specifics of each of these comfort options at HelixSleep.com. This mattress combines 3 layers of polymer & foam to make a 9.5” thick mattress. The top layer is a 2″ hyper-elastic polymer grid. The top layer of poly foam is meant for two main purposes. Comfort, mainly focusing on pressure relief and alleviating pressure points for an ideal support and sink. And the other is cooling, using a grid to help circulate air and dissipate heat. These ideally work together to create a temperature regulated top layer that is soft yet supportive. The middle layer is 3.5″ of transitional foam. The middle layer of transition foam is intended to work with the top layer and help provide deep comfort. This layer also helps with distributing weight evenly over the mattress. The 4″ base layer creates a foundation to support them and complement the top layers. It also adds to the overall durability and longevity of the Purple mattress. All of these layers are covered in a breathable polyester-blend zippered cover. It is a combination of 69% Polyester, 27% Viscose & 4% Lycra. The cover on this mattress is breathable, soft and has a nice response to it. It also is a zippered cover that is easy to remove and clean. The neutral white design is jazzed up with purple branding as well as a diamond pattern to add some interest. Ready to try out the infamous purple grid for yourself? Get the best pricing at Purple.com. The materials and construction of these mattresses are almost identical, with the exception of the Nightfall. Each mattress is 10″ thick and is a made up of 4 layers. Two top comfort layers, a durable coil system, and dense base foam give each of these beds a unique feel. The coil system is standard across the board and is a 6″ pocketed coil set with reinforced perimeters. The comfort foams are a top layer of Memory Foam over a Helix Dynamic Foam. Together they make a responsive yet perfectly contouring feel. Each of these foams vary in density and firmness depending on which mattress you get. This is also true of the base foam under the coil system. The durable foundation will slightly vary depending on the mattress, to give more or less core support. And we can’t forget the soft and breathable zippered cover that is removable that each Helix mattress comes with. Not only is this cover easy to remove but machine washable for easy cleaning. And there is even the option to upgrade this cover to a cooling mattress cover for the warmer sleepers too. The Nightfall (big and tall) mattress has a few additions that make it 12″ thick and a total of 5 layers. The Helix Dynamic foam rests over a layer of dense memory foam as well as an added layer of deep comfort transition foam. This added layer creates better comfort for a heavier body. This is over an XL wrapped coil system and super dens base foam. Giving the Nightfall a superior build and ideal materials for the overweight sleepers who need better support without compromising comfort. Like the thought of choosing the perfect Helix hybrid bed for you? Get the latest pricing at HelixSleep.com. When it comes to motion isolation these mattresses both do well. The Helix mattress excels in this category due to the combination of materials and build. Though the Helix is a hybrid that contains a coil system the addition of multiple foams as well as the pocketing of each coil creates limited partner disruptions when getting in and out of bed or tossing and turning. The dense layers of foam are soft enough to easily absorb excess movement while still maintaining ideal support. And the coil system, though easy to move, features individually wrapped pocketed coils that are not only encased in fabric but independent of each other. Making for very minimal motion transfer in any of the Helix mattresses. The Purple’s grid is made out of a more responsive material, making it easier to move on. However, this doesn’t necessarily translate to more vibrations. Because of the design of the grid when weight is put on it the polymer it tends to compress under the weight, minimizing motion transfer. It also is contained by the transition and base foams under the polymer grid. These poly foams absorb the movements and help keep partner disturbance to a minimum. Making this another contender when it comes to a bed with good motion isolation. Sleeping cool is a “hot” topic… pun intended! Many sleepers have a tendency to increase body temperature over the course of sleep. Making a once comfortable and temperature neutral spot a hot mess of discomfort. 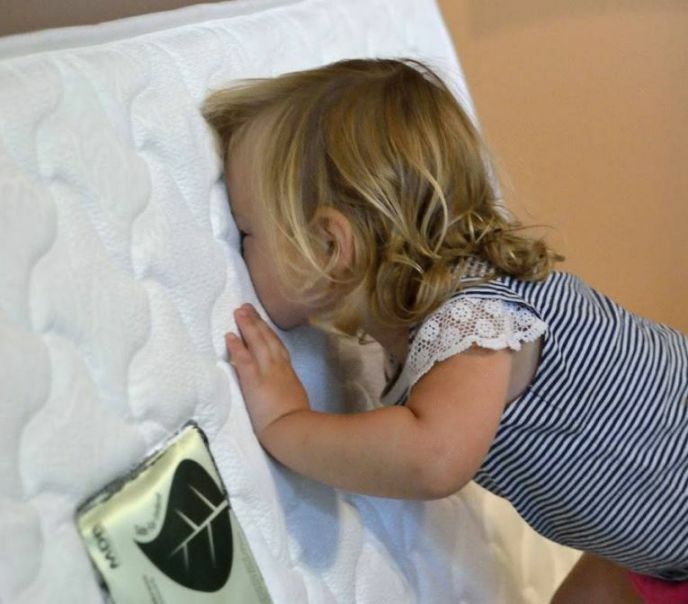 Many mattresses try to alleviate this issue by using certain materials that are able to retain less heat, dissipate heat and allow for more air flow. The Helix does a great job for providing a temperature neutral surface that maintains a more neutral feel throughout the night. A hybrid mattress always ensures that heat has a place to dissipate. The coil system allows for air to flow and any trapped heat in the top layers a place to go. The top layer of memory foam may provide a bit of retained heat, but the addition of the dynamic foam under it helps give more response never leaving you stuck in one spot. Two other options that can help with sleeping cool on the Helix mattress is the option of choosing a firmer bed. The softer a mattress is the more you sink in and less air flows around your body. Making a medium feel less warm and a firm feel the best choice for sleeping cooler. Also, Helix offers an upgraded cooling cover to help right at the surface. This cover helps wick away moisture as well as provide a cool to the touch feel that helps neutralize heat over the course of the night. Learn more about the Helix Bed in our in-depth Mattress Review or at HelixSleep.com. The Purple mattress is designed with the intention of sleeping cooler, especially compared to other foam beds. The construction of the polymer grid allows for ample space between the rows and columns. This creates more air to flow and less heat will be retained. The cover also breathable and thinner allowing for better heat dissipation too. Though this bed may work better than other foam mattresses for sleeping cooler a hybrid build will almost always be more ideal. 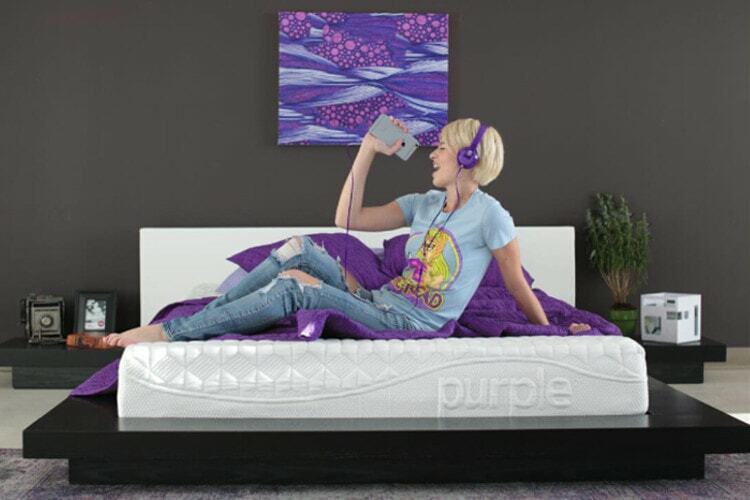 Learn more about the Purple Bed with our in-depth Mattress Review or at Purple.com. When it comes to the edge support of these mattresses their materials and build really separate their performance. The Helix uses a 6″ coil system with reinforced edges making the support around the perimeter solid and stable. This provides a very consistent feel for every part of the bed. Making the sleeping surface full usable and making no difference whether you are sleeping solo in the middle or sharing a bed and right up to the edge. Even for minimal sitting the edges of the Helix will provide the necessary reinforcement to hold your weight. The Purple falls short in comparison. The edge support does feel less stable once you are right up to edge. Even with your weight evenly distributed the full use of the sleeping surface is underutilized due to a lack of edge support. The grid may provide good airflow and pressure relief, however, it does lack on stability around the perimeter. This is especially true for sitting too. Giving minimal support regardless of whether you sit for a few minutes or longer. Giving the upper hand to the Helix if a more durable and usable perimeter is desired. When it comes to value there is more to it than just price. Both of these beds come in right around the same price. However adding that to the materials, performance, and options each of these mattress models provide, may shift your opinion on which one is a better value. The Helix has a solid and durable build with several options to work specifically for your sleeping needs. With top marks in comfort, motion transfer, sleeping cool and edge support. All for a very affordable price tag too. The Helix Sunset, Moonlight, Midnight, Dusk, Twilight and dawn mattresses all come in at $995 for a queen size. While the Nightfall, Dual Balanced, and Dual Extra come in at $1190. With Twins starting out as low as $600 and King mattress sizes ranging from $1245 to $1440. This doesn’t even include their latest coupon which makes this one of a kind mattress even more reasonable. Make sure you get the most up to date coupon available at HelixSleep.com. Save BIG On Your New Helix Hybrid HERE! The Purple has several unique qualities about it that make it stand out from much of its competition. The feel and benefits of this mattress may appeal to several sleepers. If your primary concerns are pressure relief and sleeping cool than this bed may check the boxes you have. The Purple mattress comes in at $999 for a Queen size. And is offered in a Twin XL, Queen, King, and Cal King that range from $699 to $1299. And now Purple is also offering financing as well. Learn more and get the latest pricing at Purple.com. The Helix and Purple both come with a 100 night sleep trial period. This time frame allows for your body to make any adjustments it needs to. As well as for you to see if your new mattress is a good fit for you. Both offer hassle free returns and full refunds if for some reason you don’t love your new bed. The customer satisfaction and service will certainly not be lacking whether you get a Helix or Purple mattress. Both also come with a 10 year prorated standard warranty. This warranty ensures that any manufacturer defects or flaws are covered by the company. Making sure you have an optimal sleeping surface. Though both are also prorated to coincide with the natural wear of the bed. Still looking for more information outside of our Purple vs Helix comparison? Learn more about each of these mattresses in our in individual reviews. The Helix Mattress Review and Purple Mattress Review feature videos, images and our experience sleeping on each. Also, looking for more comparisons? Check out our Mattress Comparison Tool that allows you to pick up to 4 mattresses to see side by side. This is a great way to help you quickly see the differences and compare and contrast. As well as find our most recent coupons too. Otherwise, make sure to check out all our in-depth comparison reviews on our Mattress Comparison page. And lastly, not finding the answers you’re looking for? That is why we are here! Feel free to contact us and we will help you answer any questions, make suggestions or help you in your mattress journey. Our Sleep Guide is here to help you!